I've been truant from this space, but it's not for lack of eating, cooking, or writing. Perhaps too much of everything has kept me away. Our CSA season has kicked off and we're drowning in strawberries and rhubarb. 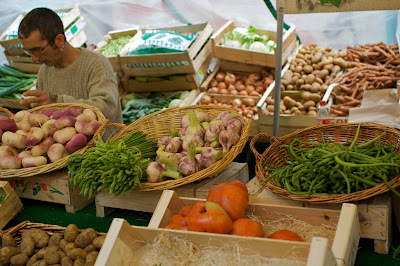 The markets are spilling over and I can barely keep pace with all the asparagus and young onions and tarragon. And then there was Paris. Paris? Mais, oui! The Mr. and I got to escape for a bit, sans enfants, to one of my most favorite places on earth–a place that, some time ago, I called home. These days, I return as an unabashedly giddy tourist, navigating the streets more confidently than I did when I landed there after college: a vegan with a backpack full of too-colorful clothes, trying my best to blend, ignoring with all my might the lovely charcuterie and oozy cheeses laid out fetchingly everywhere I turned (in case you're wondering, I didn't hold out long). I know exactly what I want to eat now, and it's everything, and exactly the spots I need to head to, and they are usually markets (it's a good thing Ben, my husband, is a good sport). 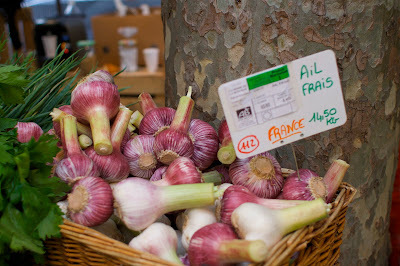 The Sunday organic market on the Rue de Raspail overflowed with the most amazing wispy wild asparagus and tiny strawberries, fat bulbs of purple garlic and more exotic things, like softball-sized melons from further south. 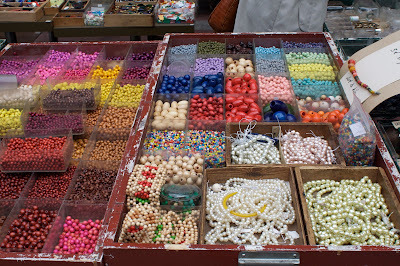 Saturday, a massive collective yard sale spread across Les Halles–an inflated version of the stoop sales that dot our Brooklyn neighborhood on sunny weekends; very briefly, I felt homesick. I can never miss the Marché aux Puces (flea market) at St. Ouen, because there's a fix for every collector junkie out there, whether the poison of choice is beads, records, vintage dolls' eyes, or old earthenware pitchers. Of course, there are those luminous nights. And the food! Pain au chocolate and café serré in the mornings, draughts of wine at lunch after so much walking, a big tureen of creamy cucumber gazpacho at Les Papilles, salted caramels, and, of course, macarons. So where does the wretched sardine fit in with all this glamour? First of all, let's get something straight, in case you think you're not a fan of these glittering little fishes. Maybe you have something against tinned seafood, which, by the way, has nothing to do with the fresh version: different beasts altogether, with their quicksilver skins and heads still intact (fish heads aren't your thing? Then off with them!). Their flavor is clean and full, defying their small size, and their texture denser and more sprightly than that of canned ones. Before I hopped the plane, I had them on the brain, and I had been, before I ran out of time, planning a post on them. I boarded, promptly forgot about this blog, and then: wham! Our first meal on the other side featured the most ethereal marinated sardine fillets, artfully combined with lemongrass and citrus, tomato marmalade and olive tapenade–definitely the most dressed-up sardines I've ever tasted. 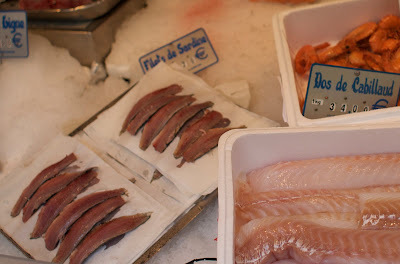 My introduction to fresh sardines occurred in Paris, so many years ago, at the wine bar where I worked during my stay there. They would come in from the market at Rungis on unpredictable Saturdays, sparkling and smelling of nothing but sea water, and they needed very little fussing. Not that the kitchen would have had space for that. They were simply slid under the salamander with heads still on, splashed with olive oil and coarse salt, and left to sizzle and pop for a couple of minutes on each side. The skin would crisp toasty brown around the edges, then a generous squeeze of lemon would supply the crowning touch–nothing else needed. Maybe some mustard, if you were so inclined. 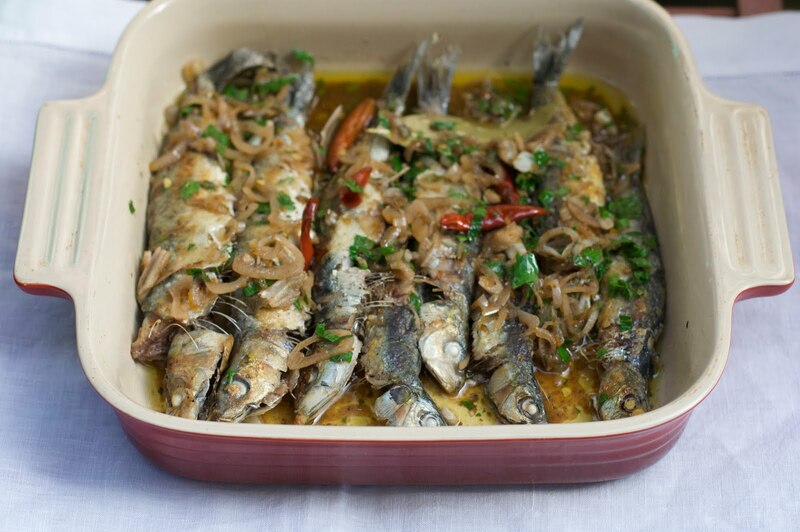 Sardines, I've found, do fancy and basic with equal ease–and I've had them both ways in Paris. Here at home, fresh sardines are simultaneously one of the cheapest and (I think) most delicious things our fish store carries. They are sustainable, packed full of Omega-3's, and reassuringly low on the aquatic food chain–so you needn't worry about mercury contamination. You can cook them the wine bar way, under a broiler (just don't let them burn), or check out the recipe below, one I've returned to again and again, in which the fish are briefly sautéed and then marinated in an acidic mixture. Though many similar recipes call for fillets, I leave the fish whole; I suppose this is partially out of laziness, partly from a belief that cooking things on the bone enhances their flavor. The recipe works either way. The taste is vinegary, citrusy and a little spicy, and the onions pickle in there–an added bonus. There is a few hours' wait time between cooking and serving, but that makes this a great dish to prepare ahead and return to after a busy summer afternoon outside. Serve with a warm potato salad. The next day, you can fillet the sardines and serve them over heaps of arugula, along with those tangy, aromatic onions, atop crusty bread. Mix together flour and a bit of salt and pepper in a medium bowl. 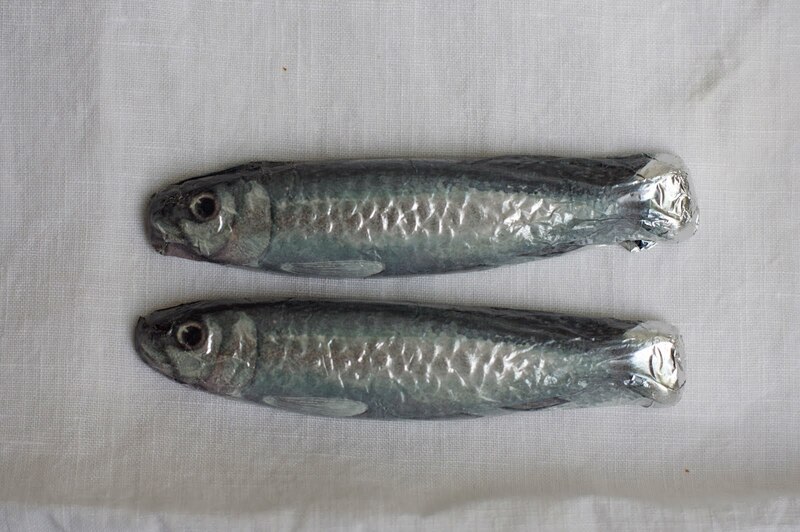 Rinse sardines and pat dry. Dredge them in the flour mixture and shake off excess. 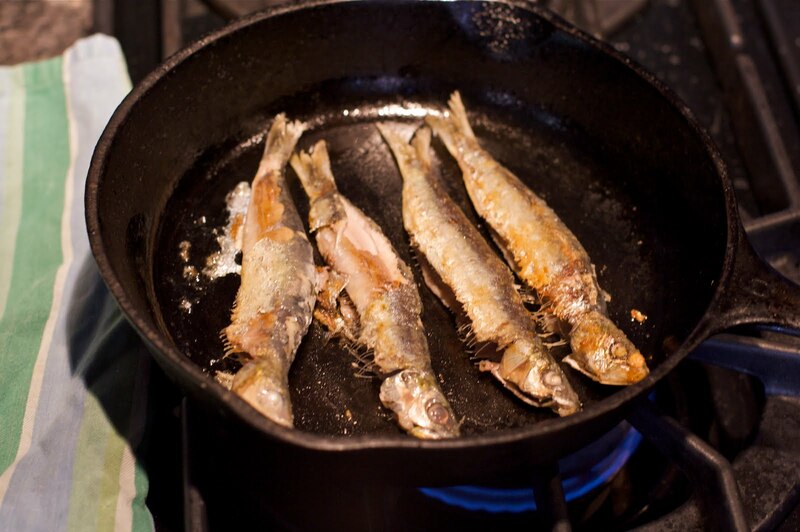 Meanwhile, heat a heavy skillet over medium high heat, add a couple tablespoons of oil, and fry the fish about a minute or two on each side (a little more if they are especially large). 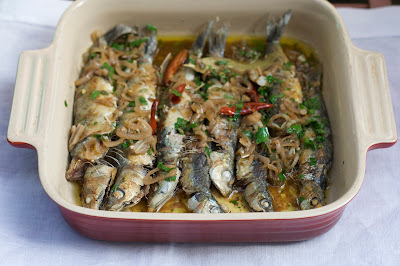 Transfer cooked sardines to a casserole dish that will fit them snugly. 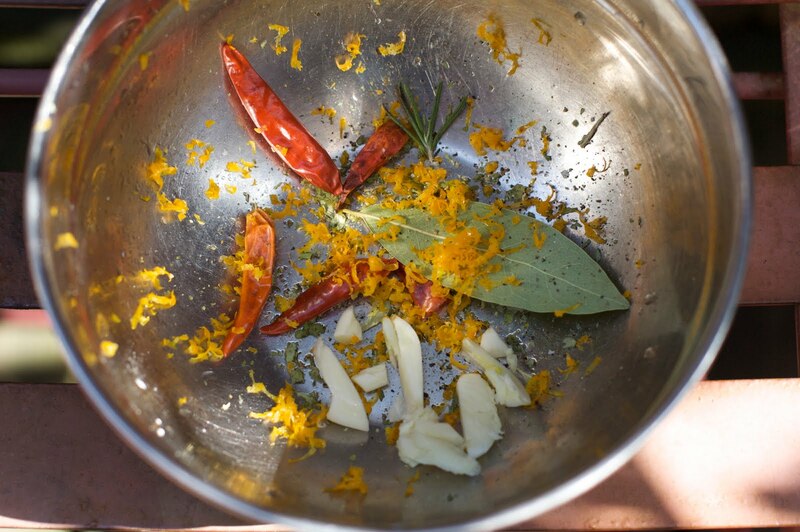 Add remaining ingredients–except for olive oil and parsley–to skillet and bring to a boil. Lower heat and simmer for about 15 minutes, then remove from heat and whisk in remaining oil and parsley. 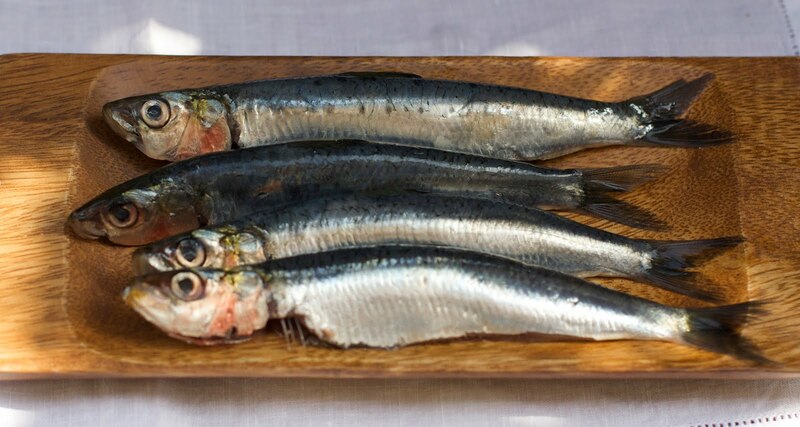 Pour over sardines and allow to marinate this way for 4-6 hours, refrigerated (up to 24 hours), before eating. To serve, bring to room temperature and fillet each side by working a small knife along the rib bones, from head to tail, then removing flesh from bones. I do not like meat but I love fish... what an excellent post, images and sardine recipe! !